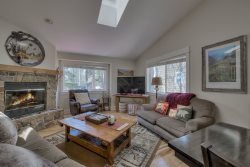 Our luxury vacation rentals in Breckenridge, Silverthorne and beyond offer incredible Rocky Mountain views, stellar downtown and out of town locations, updated interiors, attached heated garages, washer, and dryers, gourmet fully equipped kitchens, soaking Jacuzzi bathtubs, private hot tubs and/or clubhouses with hot tubs and heated pools and much more! So why not spend your next Colorado vacation in comfort and style? Seach available luxury vacation rentals below to find breathtaking homes and condos located throughout Summit County perfect for your next trip. What other reasons do you need to book now? Contact us for additional assistance finding the right property for you. Gorgeous 6 bedroom home minutes from Keystone- Long Term Only 30 days or more! Spectacular Keystone 4 bedroom at the Edge of the slopes! Gorgeous 5 bedroom 4.5 Bath in Keystone!